Kempinski Hotel Mall of the Emirates is a luxury 5-star hotel in Dubai adjacent to the Mall and indoor ski slope, where the hotel juxtaposes the alpine slope and desert landscape in a one-of-a-kind hospitality experience. The client wanted to welcome guests to the hotel with a spectacular feature installation in the lobby that reflected the hotel’s identity. Capsule Arts was tasked with seeing this ambitious and technically challenging project from the concept stages through to production and installation. Giles Miller Studio was commissioned to create a three-dimensional wall installation titled ‘Drift’. 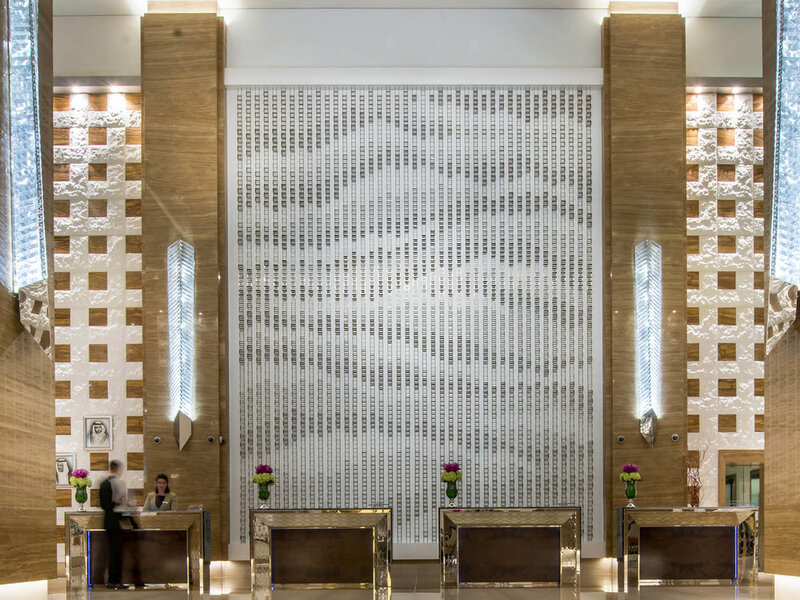 The artwork is a homage to the creation of the world’s first and largest indoor ski resort, referencing both the snowy mountainous terrain which inspired the hotel and the undulating sand dunes of Dubai and the neighbouring Emirates. 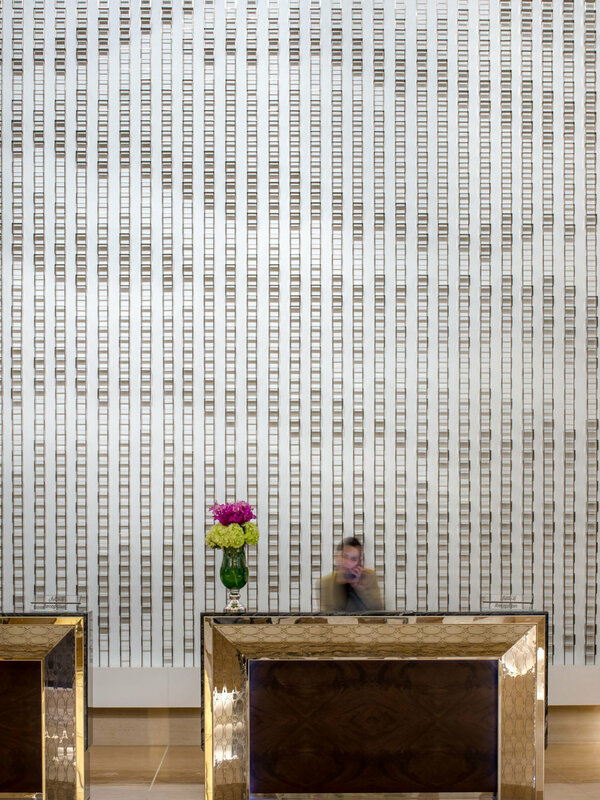 Thousands of bronze-finish box elements of varying depth, colour and transparency were hung cascading down the face of the reception feature wall. When viewed from afar, a pattern emerges which is inspired by the natural contour patterns left by the wind in both snow drifts and sand dunes. When fully lit, the installation forms a breathtaking centrepiece for the hotel lobby, aiding Kempinski Hotel in offering their guests a unique experience. 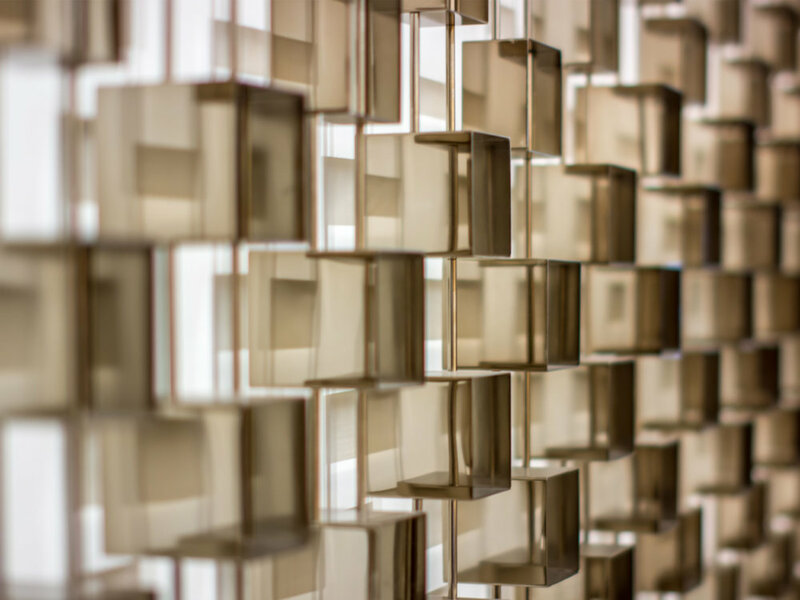 London-based design practice, Giles Miller Studio, specialises in the development of innovative material, surface and sculptural design projects and artistic installations. Capsule Arts has an ongoing relationship with the studio and we have collaborated on several high profile projects to date.